Do you use Pinterest to promote your business or have you ruled Pinterest out as a social media platform because you don’t have a business that obviously lends itself to ‘pinning’, perhaps because you don’t sell products? You could be missing out on a valuable source of sales and website traffic. From these stats alone, we can see that Pinterest users tend to be actively engaged with the platform, using it when they’re looking for things to buy, plan or do. 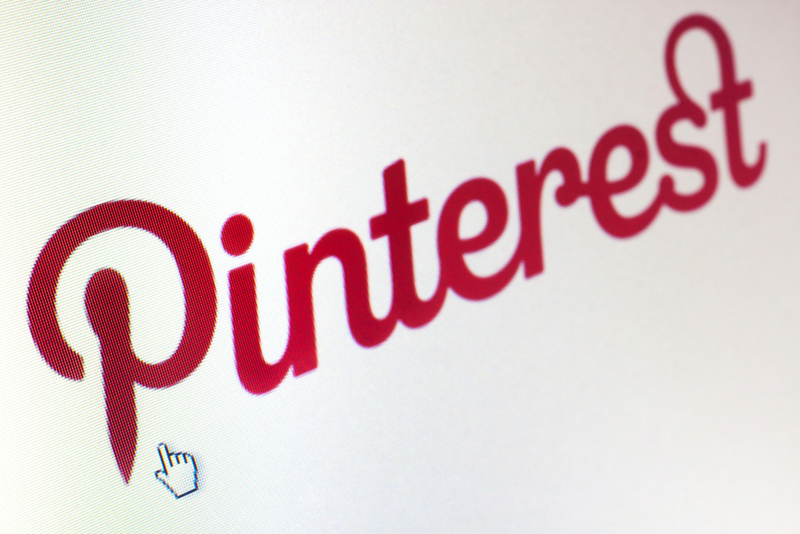 And Pinterest is growing at an impressive rate – from September 2013 to October 2013 alone, it reportedly grew by 30.6%! Figures would also suggest that the half-life of each pin is about three and a half months, which is 1,600 longer than the life of a Facebook post! Pinterest now accounts for 10.38% of social media referrals to commerce websites, adding up to some serious web traffic. This is important for your SEO efforts as Google looks at traffic coming into your site (and staying on it) as one of the cues that determine its quality and relevance. The higher these are, the more they will impact positively on your rankings. One stat that particularly leapt out at me is that the most popular destination of pins is blogs. This is a perfect example of how you can use Pinterest to promote your business, even if you don’t sell products. You could set up a board for your blogs and guest blogs and pin each new article to this board. People can then ‘repin’ your articles to their own boards, encouraging their followers to read them. Also, by adding the facility to quickly and easily share your blog posts to social media, including pinning them to Pinterest, you can help your blogs to be more widely disseminated. Stats for American traffic suggest that five percent of Pinterest users who find a blog article they enjoy will pin it for others to see. Although I don’t have the UK stats, it’s still a good idea to make it as easy as possible for others to spread the word about your amazing content. Stats from Wishpond tell us that 70% of people on Pinterest use it to get inspiration on what to buy, compared to 17% of Facebook users who do the same. But can you really use Pinterest even if you don’t have an obviously visual business? I think you can – you might just have to get more creative about how you do it! I would always recommend approaching Pinterest with a strategic view. What do you want to achieve through the platform? More website visitors? A higher profile for your blog? Greater visibility for your brand? Developing your brand’s personality and tone of voice? Pinterest provides some handy analytics that let you monitors stats such as your average daily and monthly impressions and viewers, your best performing pins, where your audience lives, what language they speak, whether they’re male or female, and how the pins from pages on your website are performing. By keeping a close eye on this data, you can quickly build your presence on Pinterest and bring more visitors to your website who are primed to buy and spend time there. As we’ve discussed, this can only be a good thing for your SEO efforts. Giraffe CVs is a professional CV writing company, i.e. not a business that obviously lends itself to Pinterest as it’s all about words, not images. 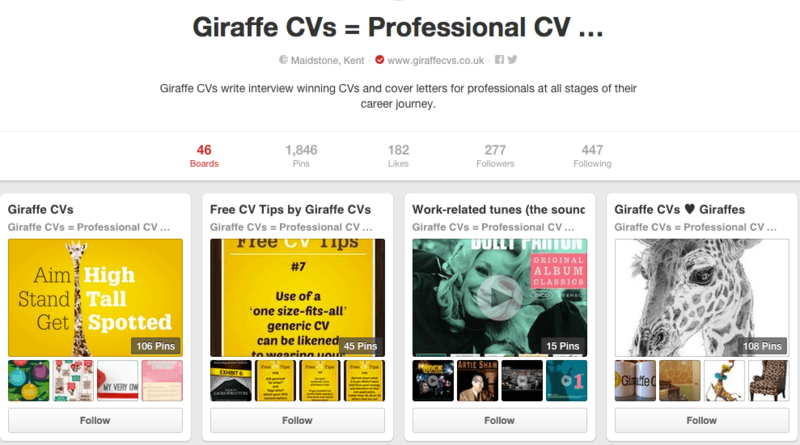 However, when you visit Giraffe CVs on Pinterest, you will find 46 boards and more than 1,800 pins covering topics such as Free CV Tips (presented in a visually appealing, branded style), Customer Testimonials, Graduate CVs, Unusual CVs, Career Quotes, Infographics to aid your job search, and Pins linking to The CV Confidence Coach podcast by Giraffe CVs. In addition, Giraffe CVs uses humour a lot in its marketing and some of the boards reflect this. Check out the Spoof CVs, Celebrate your new job board or Work-related tunes boards for a bit of a giggle. Knowing that fashion pins are incredibly popular, Giraffe CVs even has ‘Interview chic for women’ and ‘Interview chic for men’ boards. Giraffe CVs think outside the box on Pinterest. It’s a company that understands its customers and its brand and plays to this, creating a visual feast even though it doesn’t have a single product to showcase. What type of images can you use? If you sell products, then it makes sense to have a board or boards on Pinterest featuring good quality images of these products. You can include a short product description and call to action to encourage people to click through to your website and buy (apparently, a call to action noticeably increases engagement). If you don’t sell products, then you may need to be more creative about the images you use. In the case study above, Giraffe CVs presents free CV tips on a branded background with a different tip number on each one – it almost looks and feels like collecting top trumps or baseball cards, which is a great way of encouraging people to pin the whole series. If you write a regular blog, you can pin it using any of the images in the blog. It is essential that you have permission to use any images you pin commercially, otherwise you could be in breach of copyright. Look for images that are covered by a Creative Commons license with commercial use allowed if you simply want to use an image on your website or in your marketing (you may need to credit the photo and link to the license). If you want to adapt the image in any way – perhaps by adding an inspirational quote – you also need to make sure that the license allows modifications. Do you use Pinterest for your business yet? Why not share your profile in the Comments below so that we can all have a look? Have you stayed away from Pinterest because you don’t sell products? I’d love to hear your thoughts.